Friday, a shocking photo went viral online. 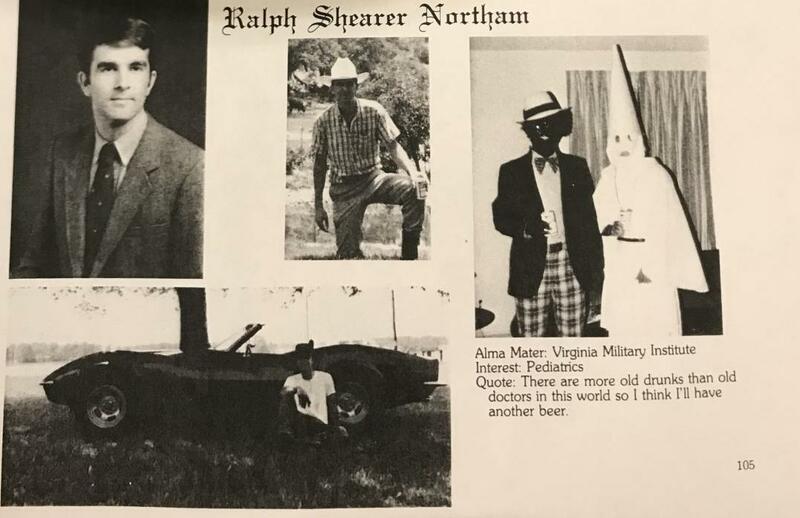 On Ralph Northam’s yearbook page a photo shows two men, one in a Ku Klux Klan robe and the other dressed in blackface. Originally, this photo was released by a conservative news site, Big League Politics. “The photo, which The Virginian-Pilot obtained a copy of Friday from the Eastern Virginia Medical School library, comes from the 1984 yearbook, the year Northam graduated.” Virginia-Pilot reports. At this time the identity of the men in the photo has not been confirmed. But the photos placement on Ralph Northam’s page suggests his connection to the photo. In either case, Virginians are furious that Northam would allow the photo to be placed just under his name. This comes just after the Governor’s extreme abortion comments. What a hoot. A little context, if you will. From 26 Oct 2018 Rolling Stone: Megan “Kelly claimed that blackface was acceptable in the context of Halloween costumes, saying it was ‘OK when I was a kid as long as you were dressing like a character”.” She was immediately fired from NBC. So, now, democrats, how can you justify Ralph’s more egregious behavior. He didn’t just talk about it, he actually was involved in denigrating black people! I think Gov. Northam should resign effective immediately since he’s showing his “true face” to the world. I sure didn’t vote for the gun-grabbing, leftist, infanticide supporting demorat. I agree with Edward Mack’s comments above. If this involved a Republican or a Conservative they would already be fired or about to be. There would be howling from all the MSM that this cannot be tolerated. What’s good for one is good for all. You should apologize and then resign your office, Governor Northam. I agree with Mr Mack and Mr Connelly.’s comments. During the last election Mr. Northam’s party ran several ads against Mr Gillespi depicting him as a racist with no evidence of anything in Mr Gillespie’s past to support it. If Mr Northam doesn’t resign , given his obvious past, would he be afraid of giving over the Governorship to Mr Fairfax, an African American and the current Lt. Governor? While I dislike Northam tremendously and have about as much use for him as I do a cold sore and agree he should step down because of his comments and views on abortion, I must point out one thing, Just because a picture is in one’s year book, doesn’t mean he has any connection with what’s in that picture. There’s a name on that photo, “Alma Mater” contact him and perhaps he’d know who the other person is in the photo with him. Having been a year book advisor, I know that candids are often used to fill white space.. This could be the case here.